Unquestionably one of the toughest 5K races in the world, Mount Marathon is as much of a local celebration of Alaskan heartiness as it is a hard-to-enter, bucket-list running spectacle. 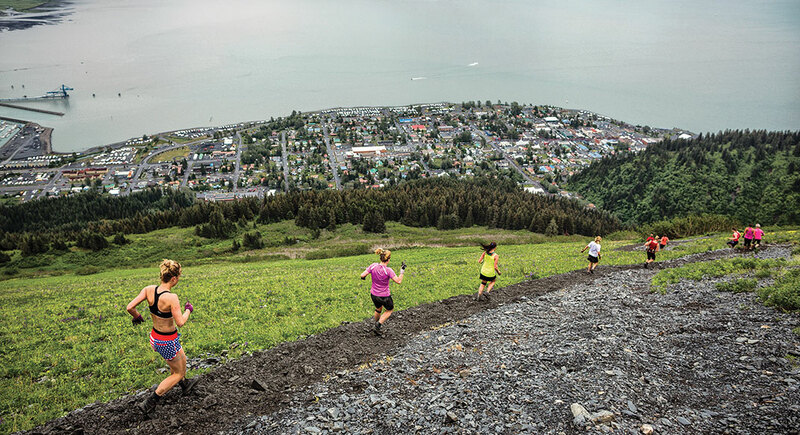 Held almost every year on the 4th of July for more than 100 years, the race sends runners up and down its ridiculously steep namesake 3,000-foot mountain that rises from the sea above the quaint fishing village of Seward. The course starts on pavement in town but then varies between dirt and rocky trails, a choice of routes over steep, rooty terrain or treacherous jagged cliffs and no route at all over a field of constantly sliding rocky scree. For each of the 1,000 runners (350 men, 350 women and 300 juniors) in the field, competing in the race is a well-earned badge of honor. 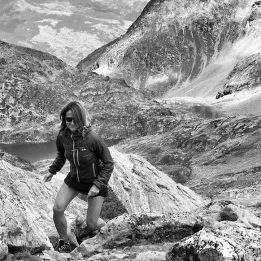 Mount Marathon features a grueling uphill slog that requires hand-over-hand scrambling and a precarious (and dangerous) downhill blast back to the finish amid throngs of cheering spectators. More often than not, runners return bloody, muddy and bruised, but that death-defying dance is what many runners appreciate most. While the race has attracted elite trail-running stalwarts in recent years, it’s close to the hearts of Alaskans. 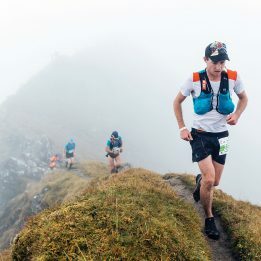 A year after Jornet’s record (41:48), which had previously only been held by Alaskans, local trail fiend David Norris took it back in 2016 with 41:26. 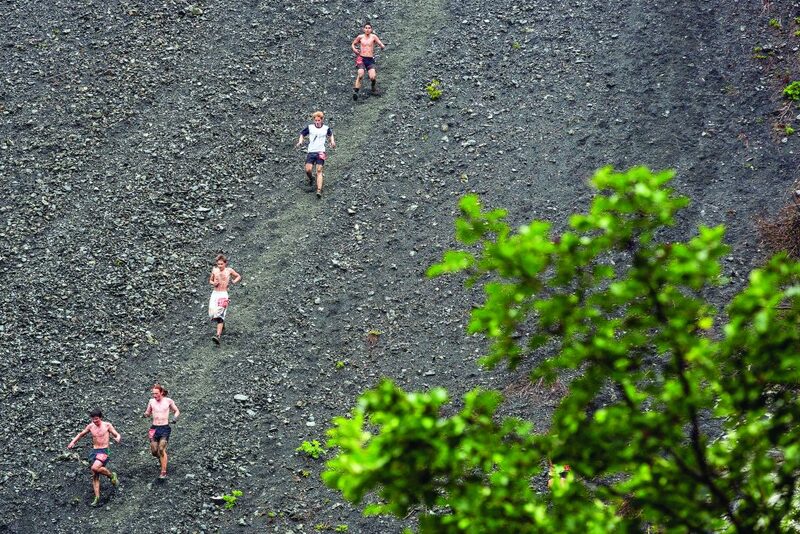 Junior racers run down the scree field during the 86th running of Mt Marathon in Seward, Alaska. Photo by Alaska Daily. Seward is a small port city on an inlet on the Kenai Peninsula and the gateway to Kenai Fjords National Park, a great place for trail running, as well as whale and porpoise watching and checking out the glaciers that flow from the Harding Icefield. If you’re going to visit Seward for a trail-running vacation, try to get a race bib for the Mount Marathon Race and make it a Fourth of July holiday trip. Lost Lake Trail, also known as Primrose Trail, begins in a lush rainforest and ventures seven miles to several stunning lakes surrounded by snow-capped mountains. Resurrection River Trail is a 16-mile trail that begins as a mostly flat route for 4.5 miles before joining a more rigorous technical trail to the Russian Lakes and Resurrection Pass trail systems. Photo by Alaska’s Focus Photography. 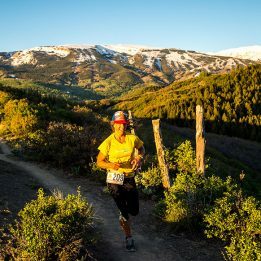 David Norris is a two-time winner of the dastardly difficult Mount Marathon race, but he’s not a typical trail runner. Most of his running is geared toward training for his primary sport, Nordic skiing. The 27-year-old Anchorage resident balances a professional skiing career while working on an MBA at Alaska Pacific University. Norris won the prestigious 51K skate skiing race at the American Birkebeiner in Wisconsin in 2016 and has competed in numerous World Cup events. Although he narrowly fell short of his goal of making the U.S. team for the 2018 Winter Olympics, he’s focused on the five World Cup ski races on his schedule this fall and winter. However, he does see a future in mountain running once he retires from skiing.